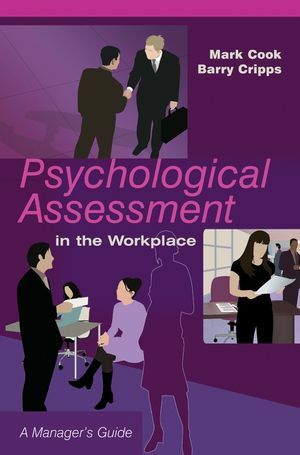 This book covers the assessment of people within the workplace. Written in jargon free language, it offers a guide to psychological assessment that can be used by managers in their everyday work. Each chapter will specifically cover an assessment practice and then explore the issues surrounding it, following this discussion with a case study. Ideas for test selection, guidance on assessment centre practice and illustrations of successfully worked exercises are also included. Mark Cook and Barry Cripps are occupational psychologists who combine academic, industry and HR backgrounds with extensive experience of psychological assessment in practice. As trainers and teachers they are fully up to date with current research in this rapidly developing field. Chapter 1: Assessment in the Workplace. Chapter 2: Using Psychometric Tests. Chapter 3: Tests of Mental Ability. Chapter 5: Sifting and Screening. Chapter 6: References and Ratings. Chapter 8: Assessment and Development Centres. Chapter 11: Other Special Assessment Methods. Chapter 12: Using Assessment to Arrive at a Decision. Chapter 15: Training for Testing and Assessment. Chapter 16: Professional and Ethical Issues. Chapter 17: The Future of Assessment.